In South Australia a short distance from the mainland lies beautiful Kangaroo Island. Over a third of the island is protected by National Parks and Conservation areas. This creates a sanctuary abundant with native wildlife from sea lions and penguin colonies to striking birdlife and mammals. Our 6 day walk has been carefully designed so you can experience a range of landscapes of striking rock formations and vast wilderness areas in the National Park, savour sensational local produce and wines and indulge in exceptional accommodation. We have designed this walking holiday so you can enjoy the scenery without the heavy burden of carrying your clothes or a heavy pack. Walk with as little as your camera, lunch and water each day and we will take care of your bags being transported to your accommodation. 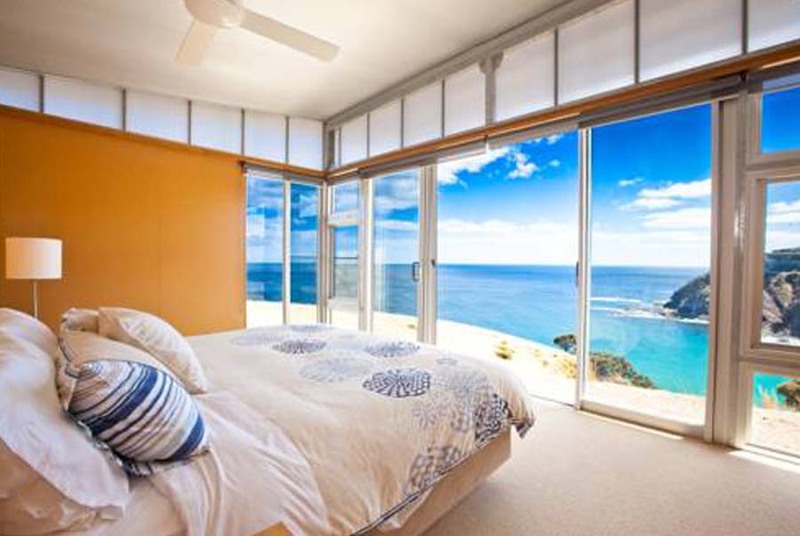 Our guests will enjoy five nights at the stunning architecturally designed Kangaroo Beach Lodges. Perched on the edge of the cliffside, this boutique lodge offers stunning uniterrupted views over Kangaroo Beach Cove with stylish modern decor. On our walk you will indulge in sensational high quality produce that makes this region unique. Dinners will be spent relaxing in the Beach Lodge, enjoy wonderful meals matched with local South Australian wines. We are very proud of our talented team of guides. We call them our CEOs – Chief Experience Officers and it’s their job to ensure your tour exceeds your expectations. Their wealth of knowledge and expertise ensure your tour is relaxing, fun and informative. Our walking tours are all genuinely all-inclusive and once you pay for your tour there are no hidden extras. You won’t need to keep putting your hand in your pocket to pay for additional items not included in the tour. Your meals, wine, activities are all included, there’s even no charge for credit card fees when booking. 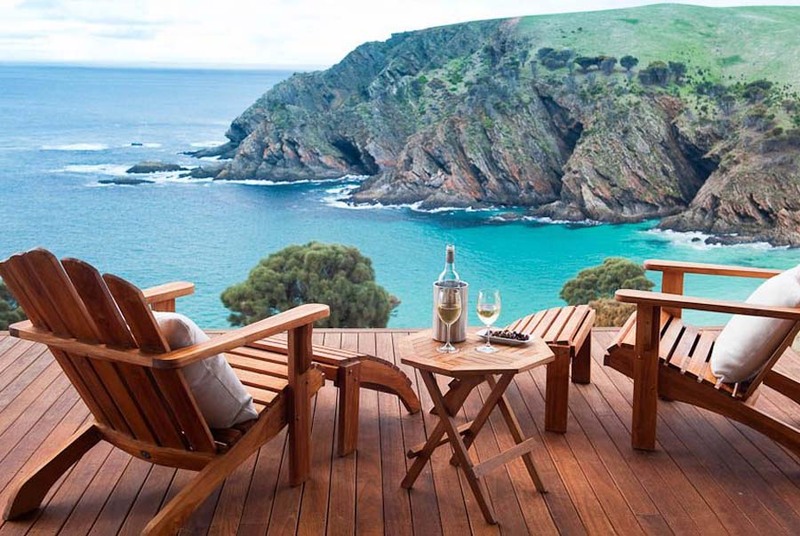 Book your morning flights to Kangaroo Island. Meet your guides at Kangaroo Airport at 12 midday. From here we are transferred to enjoy an afternoon walk from Cape du Couedic to Weirs Cove. Weirs Cove is one of the most impressive lookouts of Kangaroo Island. From the lookout, you might spot some seals playing in the bay. The historic ruins at Weirs Cove give an understanding of the extreme poverty of lightkeepers. After a short visit at Weirs Cove, we will continue to Remarkable Rocks. You will wander through dense coastal Mallee before being awarded with the superb panoramas. At the end of the walk, you will explore the 500 million year old wind-sculpted rocks and admire the striking abstract shapes and colours of the granite boulders. Afterwards we head to our accommodation at the superb Kangaroo Beach Lodges set on the cliffs edge with dramatic views over the ocean. Sit back and relax wiht a glass of wines as our guides cook dinner which has been prepared by a local chef for our enjoyment. A great way to finish the day. Enjoy a hearty breakfast before setting out from our accommodation to start our walk. Today’s walk takes us from Hanson Bay to Kelly Hill Caves. This walk is one of the most popular walks on Kangaroo Island. During the walk, you will meander through various landscapes, including pink gum woodlands, banksia heat, Mallee, coast heath and dunes. You will catch a glimpse of freshwater lagoons and beautiful views of the coast behind and the landscape ahead. From here we transfer to nearby Admirals Arch for a lovely afternoon stroll. The walk offers gorgeous coastal panoramas before reaching the Admirals Arch viewing platform, from which you can view the flourishing New Zealand fur seal colony . Afterwards enjoy a short transfer back to our Beach Lodge. Tonight indulge in a sensational dinner accompanied with wonderful wines from South Australia. 16kms.. 8 hours with breaks. Enjoy a lovely breakfast before transferring to the start of our walk. Today’s walk will take us from Snake lagoon to Cape de Couedic. Wander through the spectacular rugged landscape of the Flinders Chase National Park. Not long after starting today’s walk, you will see the first magnificent panorama of the Southern Ocean. Along the way you can spot beautiful coastal plants and the occasional remains of a shipwreck. If you’re lucky, you might spot some bottle-nosed dolphins, seals or sea-lions while walking along the coast. Afterwards we return to our accommodation at the for a superb dinner, accompanied with local wines. Enjoy a heary breakfast before we head out on our walk. Today we start at the Cape Borda before making our way to Ravine des Casoars. In the morning, we will visit Cape Borda for a lovely morning stroll. You will explore the scenic rock gardens, the highest sea cliffs of South Australia and the unique square Cape Borda Lighthouse. The lighthouse is sat on the cliffs high above Investigator Strait and is immersed in European history. From here, a short transfer takes us to the Ravine des Casoars Wilderness Area for our afternoon walk. Starting in the lush forest of the ravine valley, you will walk towards the coast passing various sorts of vegetation. During the walk, you will enjoy some incredible views of the coast and the intriguing limestone caves at the beach. Later we visit Rocky River area where you will enjoy an afternoon walk through eucalypt woodland. If you’re lucky, you may catch a glimpse of a platypus in their natural environment. In spring, you can marvel at the overload of stunning wildflowers. We return to our acommodation where you will enjoy a cooking class with our local chef to prepare our evening meal, accommpanied with South Australian wine. Photos courtesy of Tourism Western Australia. After breakfast we transfer to Seal Bay for a special tour. Seal Bay Conservation Park is on the south coast of Kangaroo Island and has been home for thousands of years to an Australian seal colony population of around 14,500. During our visit you will be taken into the heart of the colony by an experienced local guides who will give you an insight into this charming endangered species. This is the only place in the world where you can see wild sea lion which close quarters, a truly remarkable experience. After our Seal Bay tour, we will head to the Cape Gantheaume Conservation Park for our walk at Curley Creek. During the walk, you will have stunning views of Murray Lagoon while climbing Bald Hill. You also have a chance to watch migratory waders as they feed from Murray Lagoon. We head back to our accommodation for our final meal and have a celebratory wine together. Enjoy a late breakfast before farewelling the lodge and making our way to the airport, we may have time to visit a gallery, shop or museum on the way. We reach the airport at 11.00am ready to join your flights home. The end of a remarkable journey. Perched on the edge of the cliffside lies the architecturally designed Kangaroo Beach Lodges. 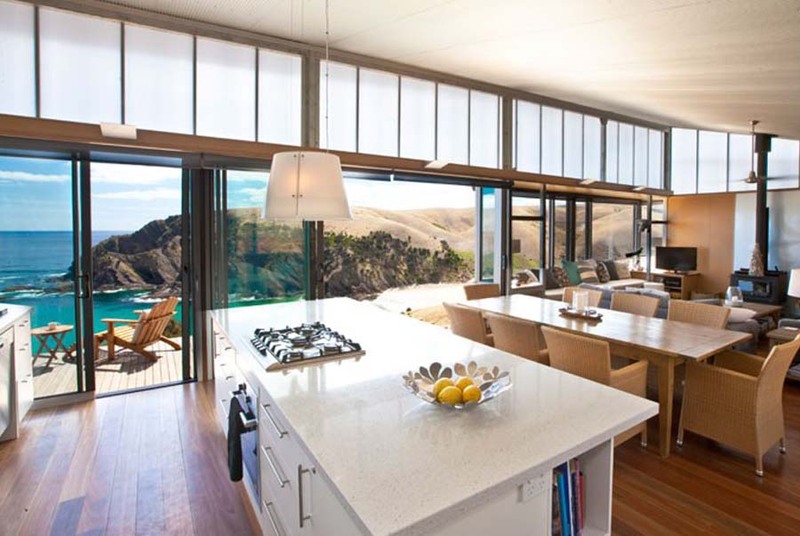 This lodge embraces the outdoors with large glass sliding doors offering uninterrupted views of the crystal clear waters of Kangaroo Beach Cove below. Each lodge features four bedrooms (king beds or two twin beds in each room) and three bathrooms accommodating up to eight guests. Larger groups can be accommodated in two lodges. With all our tours we always ensure your evening meals are something special. At night you can relax with a glass of wine as our personal chef prepares our evening meals featuring fresh local produce. On one evening you’ll even get a cooking class with the chef to learn the tricks of the trade. We are running one special departure on 18 March 2019. Walks for private groups are available for 8 or more people on a date of your choice (subject to availability). Earlybird Specials are available on 2019 departures. Save $300 per person or $600 per couple when you book and pay in full at time of booking. Book by 31 December 2018. See special cancellation policy below. Private groups of 10 or more can save an additional $50 per person (on above savings) when they book a departure. Choose a date of your choice - subject to availability. Book and pay in full at time of booking to receive these special offers. Book & Pay in full at time of booking by 31 December 2018. Available for special groups of 8-10 people. Departure of your choice. Book & Pay in full at time of booking by 31 December 2018. Deposit of $250 per person. Final payment due 8 weeks priorto departure. Prices are based on twin share of rooms. If you are travelling solo you may be required to share with someone of the same gender. If this is not suitable you can request to pay a single supplement however this is on a request basis. NO Credit Card Fees Apply. Early bird or Spot Special discounts cannot be used in conjunction with another offer. To receive these special discounts, full payment must be made at time of initial booking. EARLYBIRD CANCELLATION POLICY: Cancellations are not permitted for Earlybird Deals or Spot Specials, however transfers to another date are permitted 8 weeks or more prior to departure. We advise taking out travel insurance, in case unexpected circumstances prior to the trip, prevent you from joining this tour. We advise taking our Travel Insurance to cover items such as cancellation of tour due to injury, minimum numbers not met, or adverse weather conditions, evacuation, delayed flights, illness, etc.